Each October for the past six years, traditional Korean dancers from throughout the country have gathered along the banks of Nakdong River in the small town of Andong in the province of Kyongsangbuk-do for what is now one of the most popular mask dance festivals in Korea. In the open-air amphitheater and courtyard, along the lazy riverbanks and nearby in the traditional village of Hahoe, the haunting notes of the bamboo piri, the syncopated underbeat of the changgo and puk drums and the jangling of kkwaenggari gongs accompany the reenactment and retelling of familiar, funny and poignant dance-dramas. The playful, satiric stories are familiar to many Koreans from childhood. Their comic characters are easily recognized by their colorful, ornate masks, hand-crafted from wood gourd and papier-mache(c), and their bright red, green, blue and gold costumes. The pompous yangban (nobleman) carries on with his concubine, with tragic consequences; Malttugi, the servant, delights in hurling insults at the nobleman and gets away with it; Yeoungno – a bird – or monster in a lion mask – descends from heaven to devour the five generals; the poor apostate Buddhist monk is seduced by (or seduces) a young maiden; the grandma, the scholar, the foolish servant, the leper, the butcher and various others round out the cast. Each of the sixteen dance troupes plays out a different variation of the stories in five or six short acts. The enthusiastic audiences join in, clapping and laughing at the ribald humor and sarcastic jabs, and even dancing with the ensemble in the arena when invited. The presentation is relaxed and free flowing but behind the seeming ease of the performers lies more than a thousand years of tradition. The various tal ch’um (or mask dances) developed as an amalgam of shamanic rituals, farmers’ songs, court dances and itinerant entertainments. Village shamans performed the earliest mask dances during rites marking the harvest, for the protection of the local deities, and for burials and exorcisms. Farmers’ band music stems from communal work songs and processions through the fields with drums, gongs and music. These performances evolved in the Koryo period (918-1392) into formal performances sponsored and supported by the court officials, a practice which continued in the subsequent Joseon dynasty. The irreverent plays began to poke fun at the noble class and at the Buddhist hierarchy, and thus became a safe outlet for ordinary people, who could express in dance and song what they couldnï¿½ï¿½ï¿½t say elsewhere. In the 1600’s patronage support was withdrawn and the tradition passed to itinerant bands of dancers who traveled through the countryside entertaining the commonfolk. By the middle of the twentieth century, though, many of the dances had been forgotten, and the masks relegated to museums. The recent renaissance of mask dance owes much to the careful reconstruction of lost traditions, the dedication and practice of many artisans and performers, and to formal government support through the National Treasure System. 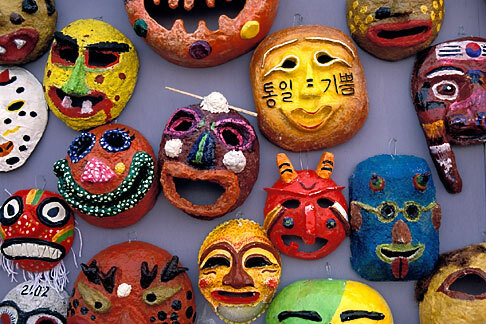 Among the towns long associated with mask dance is the small village of Hahoe in central Kyongsangbuk-do, about a five-hour drive southeast of Seoul. The sleepy, low-lying village nestled in a loop of the Nakdong River dates to the Joseon dynasty. Its elegant houses with grey-tiled and thatched roofs and walled gardens with amber-leafed gingko trees are protected as a National Treasure. According to legend a young man of the village was inspired in a dream to carve a set of wooden masks for the Hahoe Pyolshin-gut t’al-nori mask-dance. Working in secret he completed all but one before he was found out and died. Eleven ancient masks now preserved in the town museum are considered the oldest extant masks in the country. 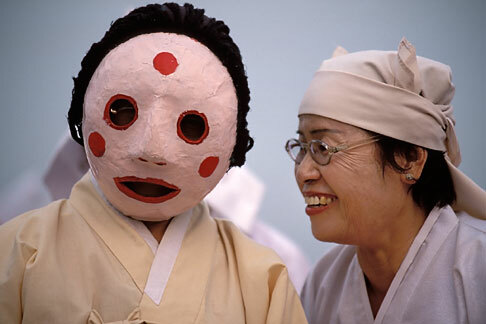 In the late 1990’s a group of dance professors at nearby Andong University met to discuss how to best further the tradition of mask-dance. 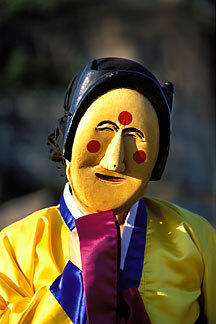 A committee was formed which led in 1997 to the institution of a national mask-dance festival in Andong. The city and national government pitched in to help and each year since then the festival has grown, attracting dance troupes from all over the country (and indeed now from places as far afield as China, Uzbekistan, Senegal and Guam!) Last October attendance at the ten-day celebration topped 700,000. At the festival site on the riverfront a small tent city is set up around the large open square, several stages and a permanent amphitheater. Booths along the perimeter offer traditional foods and handicrafts and exhibits of volunteer organizations, musicians’ groups, artisans and antique dealers. Hands-on workshops teach adults and children the art of mask making; prize-winning creations are displayed to the general public. The schedule includes performances of peasant music, wrestling, games and singing as part of an accompanying folk festival. Some games, like the massive Chajeon Nori fete (a ritualized combat between two village teams, each with a ‘general’ hoisted high on a specially constructed straw wagon) draw huge crowds to the central plaza. But the highlight of the festival is t’al-ch’um, the mask dance. 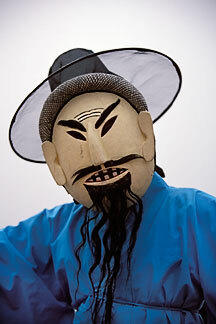 Sixteen different Korean mask dance troupes perform during the ten days in the main amphitheater and at Hahoe Village. Each group has a unique flavor and interpretation – a different take on the story, different masks and costumes and style. The most dramatic venue is along the riverside in Hahoe Village. A small stage is set up in the pinewoods on a low bluff above the sandy beach. Opposite are the rocky cliffs of Puyong-da (Lotus bluff). It easy to imagine the scene unchanged from the 1500’s, except for the cameras clicking and the safety rope to hold children back. As the audience settles, a single performer, a young bride in green and red, makes her way around the stage collecting gifts from spectators. Then two bird-like creatures with yellow lion costumes turn and twist around the stage to scare away evil spirits. The musicians’ band enters too and sits on the side of the stag – seven drummers plus two on small and large gongs. Each act is a tiny story. Pune, a beautiful maiden in yellow and blue robes and white-faced mask with red cheeks, is spied on by the old monk Chung who falls for her and spirits her away. A nobleman and scholar both come to her rescue, and then go back and forth competing for Pune’s attention as the audience giggles at the off-color jokes and antics. At the end the entire ensemble circles the stage and processes off. Most masks are made from paper or gourd as a single fixed piece, but the distinctive Hahoe masks are carved from wood and the jaw is articulated so the performer can make different facial expressions. The effect is magical. From different angles of view Pune can look happy, sad, placid or bashful. 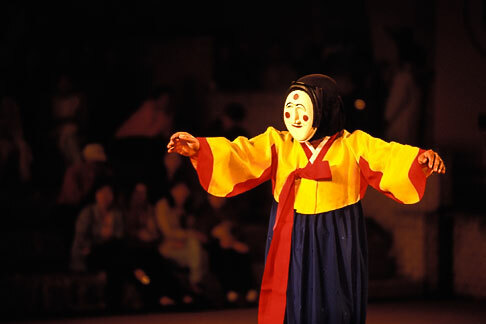 Kasan Okwangdae (Dance of the Five Clowns) begins with the entrance of a single dancer – the gold general, the first of five – who turns and blesses each of the four corners of the compass. Then the lion creature Yeongno enters and devours all five of the generals – a symbolic victory for the lower classes over their rulers! In the following scene Malttugi, the wayward servant, with a black face and hat and pointy teeth, scampers around jumping on the yangban and his companions. “Didn’t I find you in the pigsty when I went looking for you?” he cajoles, as they chase after him. Unyul t’al-ch’um has a poignant presentation of the birth of a baby to Saemaekshi, the concubine. The last act plays out a confrontation with yangban’s wife (who dies) and then in a marvelous invocation the shaman in multicolored rainbow robes, spins her way through strands of cotton in a grand finale dance. Each of the other dances has a distinctive character. 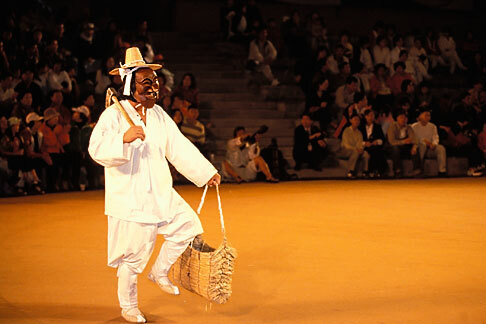 Kangnung Kwanno is performed as a mime; Pukch’ong Saja-nori has a distinctive lion dance with three men in the shaggy yellow lion costume; in Tongyeong Okwangdae the leper Mundungi laments his life and difficulties. Even though much of the plot in the dance dramas is carried in the Korean-language songs, it isn’t essential to understand every word. The mere physical effect of the dancers tells the story with facial gestures and exaggerated movements as they taunt, chase, woo and struggle with each other. The mood of the music varies, too, from sad to excited to angry to relieved. The overall feeling is beyond words. With such mastery, watching the stories unfold again and again is a continually new and refreshing experience, an enduring testament to this ancient art form. In 2005 the festival runs from September 30 to October 9. Text and photos © David Sanger. Click on images for licensing or prints. Very interesting and it adds another dimension to a photo from one of my favourite photographers – Werner Bischof – who photographed during the Korean War. I am a Festival Director of the Ephemeral Arts Festival in the UK. We are now developing a festival of masks. There will be susbtantial online content. Would you be interested in collaboration?